The stellar nursery NGC 6729 is packed with young, super hot stars that blow huge jets of material far into space, creating this insane, illuminated cloud that is shaped by shock waves. This picture was taken by the European Southern Observatory's Very Large Telescope, and is color-enhanced. Hydrogen is shown as orange and glowing ionized sulfur is shown as blue. You can see the full, glorious image here. 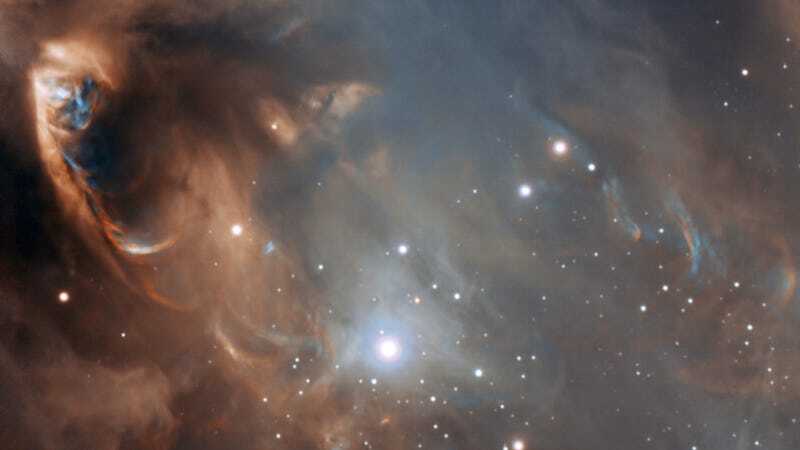 Stars form deep within molecular clouds and the earliest stages of their development cannot be seen in visible-light telescopes because of obscuration by dust. In this image there are very young stars at the upper left of the picture. Although they cannot be seen directly, the havoc that they have wreaked on their surroundings dominates the picture. High-speed jets of material that travel away from the baby stars at velocities as high as one million kilometres per hour are slamming into the surrounding gas and creating shock waves. These shocks cause the gas to shine and create the strangely coloured glowing arcs and blobs known as Herbig-Haro objects. You can learn more on the ESO website. Image via ESO.